Office 365 is the #1 Business productivity solution and the leading collaboration tool in the world. Yes, you are familiar with Word, Excel, PowerPoint and the rest of the Office Suite, but Office 365 is much more. Office 365 includes OneDrive for Business that offer 50GB per user for email and 1 TB for file storage. Combining OneDrive and SharePoint allows for real-time collaboration for employees in any location using any of the Office applications. Collaboration is further expanded as a tool to improve productivity and communications with Skype for Business. Skype for Business supports VoIP and Wi-Fi calls over a laptop, PC, Tablet or smartphone. It also provides conference calling to engage your employees, partners and, most importantly, customers. Office 365 delivers the tools to get work done for businesses to be more successful. Do your best work with the Office applications you know and trust. 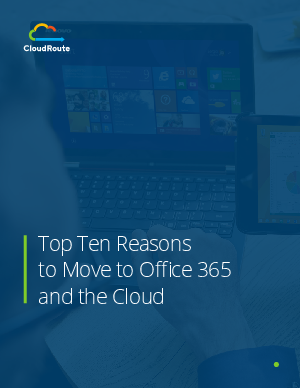 Now, in the vein of David Letterman, and the Tonight Show, What are the Top 10 Reasons to move to Office 365?